An internship at the Vatican. A year abroad at the University of Oxford. A senior thesis on extremist recruiting in the U.S. and the Islamic state. Senior political science and economics major Alex Genord said that each of these academic feats has been made possible by her participation in the University of Notre Dame’s Glynn Family Honors Program. “Glynn has been an awesome experience,” Genord said. “I was so lucky that starting from my first semester here, I was in small classes with fantastic professors who got to know us and really cared about making sure that we made the most of our time at Notre Dame. After her freshman year, Genord interned in Rome at the Patrons of the Arts in the Vatican Museum, an organization dedicated to the preservation and restoration of the artwork housed in the Vatican Museums. 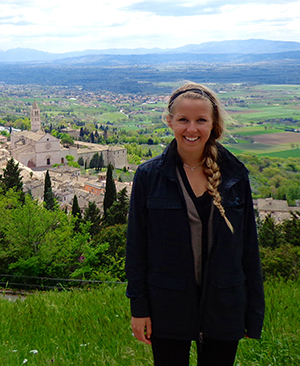 During her sophomore year, Genord set her sights on Notre Dame’s one-year study abroad program at the University of Oxford. She said professors from the Glynn program not only encouraged her to apply to but also helped her cultivate the skills she needed to succeed there. “Going to Oxford, I was a little nervous about how I was going to stack up,” Genord said, noting that classes there follow a different model than at typical American universities. Each week, students work through a reading list, write essays, and then meet with professors one-on-one or in groups of two to three students to discuss their papers and defend their positions. Genord then spent the summer after her junior year interning in Brussels, Belgium at the U.S.-European Media Hub of the U.S. Department of State’s Bureau of Public Affairs. While working at the State Department, she followed the coverage of ISIS’ advance across Iraq and was inspired to focus her senior thesis on ISIS and Al-Qaida’s recruitment of westerners through social media. “I wanted to learn more about the Americans who were choosing to join the conflict,” she said. After graduation, Genord plans to pursue a career in foreign policymaking or international affairs. As she looks back on her time at Notre Dame, Genord said one of the things she values most is the sense of community within the Glynn program. “In the Glynn community, you’re challenged by your classmates constantly, and it makes class discussions very interesting,” she said. “But, it’s also inspiring to talk with students outside class and hear all of the amazing things they’ve done. Originally published by Jonathan Warren at al.nd.edu on March 25, 2015.